KUWAIT: Dean of the Diplomatic Corps and Kuwait’s Ambassador to Bahrain Sheikh Azzam Al-Sabah said international powers have an agreement to resolve regional political disputes on a win-win basis, which is clearly evident in Syria and is likely to be used in other parts of the Middle East. Sheikh Azzam expressed hope that such a policy will succeed in stopping bloodshed, killing and displacement in various parts of the region. 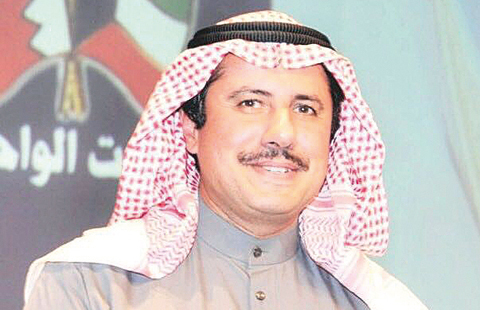 “The GCC is one of the entities that needs consolidation and unity the most at this critical phase to face various challenges and be up to its effective political and economic responsibilities,” he said in an interview with Bahraini daily ‘Al-Watan,’ expressing his trust that efforts exerted by His Highness the Amir of Kuwait Sheikh Sabah Al-Ahmad Al-Jaber Al-Sabah will succeed in uniting and protecting GCC and bridging the gaps. “The region is currently witnessing an arms race which would only lead into endless drainage of its wealth and powers in the long run, as this is usually done at the expense of development, economy and human existence,” Sheikh Azzam added. Responding to a question about GCC-Iran relations, Sheikh Azzam stressed that GCC states seek good relations with Iran to make it a partner in creating regional peace and development. “This is why Tehran has to take positive steps towards building trust and showing good intentions based on international laws and relations,” he said, underscoring that Saudi Arabia is a strategic cornerstone in the region and has played a major role in maintaining regional stability. The Court of Cassation set Sunday for the first hearing of a petition challenging an appeal’s court verdict which sentenced 67 opposition figures, including sitting and former MPs, to prison for storming the National Assembly building six years ago. In other news, the Court of Misdemeanor yesterday sentenced a real estate company owner to four years in jail after he was found guilty of fraud in cases filed by investors who bought properties outside through his company in deals that turned out later to be fake. Deputy Prime Minister and Finance Minister Anas Al-Saleh again denied reports that the cost of importing fingerprint devices will be KD 67 million. Responding to an inquiry filed by MP Adel Al-Damkhi, Saleh stressed that Civil Service Commission’s decision to use fingerprint systems at various government bodies to register staff attendance did not cost most of these bodies extra sums and stressed that the estimated cost of these devices will be only KD 2.2 million. Saleh explained that the fingerprint devices needed for the education ministry would cost KD 832,000, in addition to KD 650,000 for the Awqaf ministry and KD 770,000 for the health ministry. He added that the finance ministry’s role is only to provide the needed sums and monitor how they are spent. He also noted that the names of the companies contracted to supply and install those devices are available in various ministries. Within its strategic plans, Kuwait Oil Company (KOC) predicts producing one billion cubic feet of free gas by 2022-2023. It said that the production rate of light oil and gas will remain at 40,000 barrels and 100 million cubic feet of gas respectively once the Jurassic gas fields to the north are developed. In its annual report, KOC also noted that it aspires to develop heavy oil reservoirs in the north by getting the needed technology and training company staff on using it to reach a daily production of 60,000 barrels from Al-Ratqa field by 2018, in addition to 25,000 barrels a day from Um Naga field. A government report advised relevant bodies concerned with managing public debts to regularly report developments to both legislators and the public. The report also stressed that such regular reports will enhance transparency as well as accountability of public officials in the event of making any mistakes. In addition, the report explained that the aim of such reports will be to ensure that public debts are managed according to the goals set and approved by lawmakers and executives. “The reports should be comprehensive to allow auditors to assess how far borrowing would succeed in achieving its goals,” the report states, stressing the need that the reports should include statistics about foreign outflows and local debts. A committee entrusted with developing the infrastructure in blocks 3 and 4 in Khaitan met at the Ministry of Public Works (MPW) premises and was chaired by undersecretary Awatif Al-Ghunaim, who said that the committee discussed a detailed report about the contract of building and maintaining the roads and rain drainage in the area. Ghunaim said that MPW coordinates with other ministries on providing current and future services needed for the project, expecting to offer its tender for public bidding by the first quarter of 2019. She added that the project’s total area is 154 hectares, including 1,448 plots of 400 sq m each. She added that public buildings will also be built over an area of 3.168 hectares, including a park, a power plant, a bank, stores, a clinic, a department store and a mosque. “The area will also include around 30 kilometers of roads, in addition to rain drainage grids and manholes,” Ghunaim said.